The start of a number of steps necessary to downsize the infrastructure in the beef business began today with the announcement by Cargill of the closure of the Plainview, Texas beef plant. The plant employed 2000 people and process several thousand cattle a day. This is the first major beef plant to close since Tyson closed the Emporia Kansas plant a few years ago. Cargill attributed the closure to the drought and a dwindling cattle herd. The national herd is at its lowest level since 1952. The announcement was likely to foreshadow the closing of some feedyard capacity, especially south of Amarillo, as the industry struggles to resize. 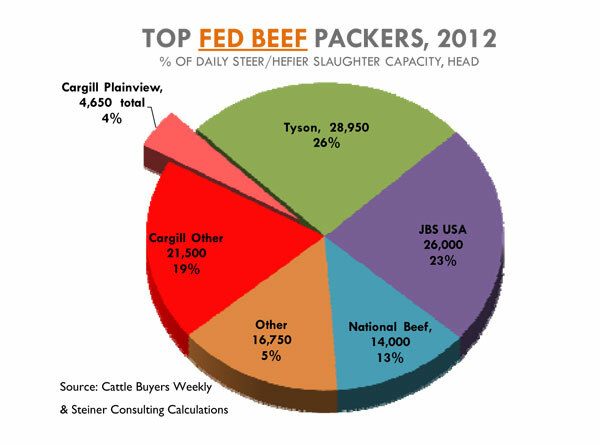 Both the processing and cattle feeding sectors are currently oversized for the size of the current cattle herd. The implications to the market will mainly be felt on the southern plains where cattle will likely suffer a $1-2 harm to their basis. Basis determination or the difference between cash and futures prices is primarily a function of plant locations and the slaughter capacity of each plant. The overview of the market is not negative. One plant closing does not change the supply of fat cattle or the demand for beef. Decisions of this magnitude are not made on the wing and a likely large number of people were involved. This creates the possibility that news will slip out. 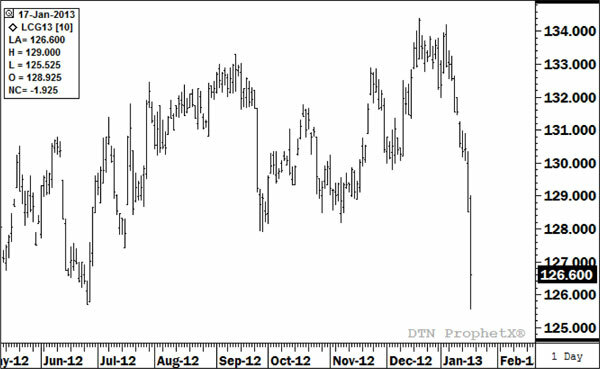 Most likely rumors started circulating last week beginning the downward pressure on futures. As is frequently the case those shorting the market based on this news might be trading a position that has little influence on the futures prices.